Inking It Up With Cathy: Back from Stampin' Up! Leadership Conference! Hi Everyone! I am back from Stampin' Up! 's annual Leadership Conference. This year it was located in Nashville, Tennessee. It was my first Leadership conference and I had a great time. 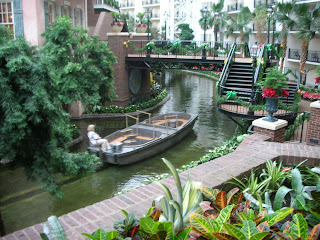 We stayed the Gaylord Opryland Hotel & Convention Center and boy, was it gorgeous! Here's a picture of the section of the hotel where my room was located. I didn't have one of the balcony rooms (mine overlooked the parking lot) but I wasn't in the room much anyway! Yes, you can take a ride on those boats! ﻿I attended a class on social networking and I am determined to be more consistent on posting to this blog so look for lots of cards and pictures from Leadership in the days to come! They announced that next year the Leadership Conference will be in San Antonio, Texas - somewhere that I have always wanted to visit. Want to join me? Just give me a call to sign up as a Stampin' Up! demonstrator and perhaps you can be there too!